From the moment that the news first broke back in March of last year that Steven Spielberg would direct Tom Hanks and Meryl Streep in a fast-tracked account of The Washington Post and its battles against the White House to publish the Pentagon Papers, it was pretty obvious that politics were indeed on their minds, just not the kind that dominated that time period. In a modern world where top news organisations are being labelled by people in power as being fake and immoral, and in some cases actually barred from reporting on certain affairs simply because that particular person does not like what they have to say, a story such as the one in The Post is frightfully relevant in how it presents its case for freedom of the press amidst an administration with dirty secrets to hide, and Spielberg and his two powerhouse leads are big enough names to not only get this made in time for awards season, but also bring this point across without letting its intentions cloud their better judgement. Their efforts, all done within a short amount of time last year, seem to have paid off as the movie is a mostly strong piece of work that tells a fascinating story which we all need to be reminded of, in case we ever forget where the true power lies in publishing what we are free to publish. We are transported to the early 1970s, when a series of documents are leaked which contain knowledge that the US government dating back to the Truman administration knew that the Vietnam War was virtually hopeless, yet continuously deceived the general public into believing otherwise. Katharine Graham (Streep), the first female publisher of The Washington Post who has been put in charge following the death of her husband, and her editor Ben Bradlee (Hanks) catch wind of the story until The New York Times publishes it, only for them to be subsequently barred by a court injunction from reporting any more of the leaked papers. Undeterred, Graham and Bradlee collude to go ahead with their own exposé, facing difficult challenges along the way from Graham’s lack of confidence to lead the company due to her stance as a woman, to Bradlee and the several reporters working on the story coming face to face with government opposition. With it being a Spielberg movie, there’s no denying that it’s rather handsomely made; collaborating with regular composer John Williams, regular cinematographer Janusz Kamiński and regular editor Michael Kahn, Spielberg is able to show this complex story unfolding with grace and a whole lot of hubris. You can tell that this is a story he really wants to tell, regardless of its obvious modern parallels, because he injects life and endless intrigue into a dialogue-heavy movie that could have otherwise been so incredibly dull, but instead actually achieves the near-impossible and makes 70s journalism seem like a rollercoaster ride of emotions at times, enough to where you’re actually invested in what’s going on. Not since Spotlight has on-screen journalism seemed so cinematic, which given the fact that that film’s co-writer Josh Singer was brought on board to re-work the script by first-time screenwriter Liz Hannah makes the connection to that worthy Best Picture winner all the stronger, though I personally doubt that The Post is going to replicate that film’s success this awards season. The reason I think that is because, while it’s definitely well-made and the acting by both Streep and Hanks is impeccable (as are a lot of the ensemble supporting cast including Bob Odenkirk as Washington Post reporter Ben Bagdikian), it’s perhaps a little too much within the zeitgeist of current politics for its own good. It is an important story, don’t get me wrong, and I understand completely why it was made, but there’s always a sense of familiarity overclouding it, given everything that’s going on right now in the current White House administration, and after the current Commander in Chief’s disastrous first year in power it’s difficult for anyone to really view this film without thinking about all the stuff happening right now with the White House and their own anti-media agenda. The script too can be a bit on-the-nose at times with its obvious parallels to Nixon’s administration and the one we’re in right now, and no matter how much Spielberg and his team certainly seemed to want to make this movie even they can’t shake away those thoughts that tend to distract from the story they’re trying to tell. It’s unfortunate as well as ironic that the very thing they wanted to draw real-life comparisons to in the first place are the very same ones that prevent this movie from standing firmly on its own, and to its detriment it’s perhaps a little too flawed to wow Oscar voters enough for them to give it some of their top prizes (there’ll probably be nominations, sure, but don’t expect any wins come the awards ceremony on March 4th). Be that as it may, The Post is still a fine enough movie for audiences to sit down and be treated as intellectuals, treating this sensitive real-life story with enough cinematic poise to it that makes it far more respectable than the far more cynical Oscar-bait movies out there. It’s a respected filmmaker and two acting legends at the top of their game here, all of whom work their individual magic to make this work as much as it does, flaws and all, and while I can’t say that this will be the one to beat come Oscars night, it’s a solid little contender all the same. 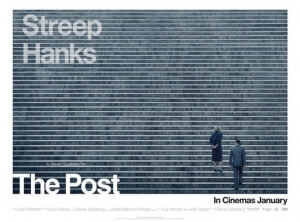 The Post is a fairly solid movie detailing the publication of the Pentagon Papers in The Washington Post, that’s handsomely directed by Steven Spielberg and impeccably acted by Meryl Streep and Tom Hanks, although its obvious parallels to the current political climate and its own anti-media agenda can potentially take one out of the story being told here, which is fine enough material to be shown on its own.